Dennis Rodman is a retired NBA power forward who played for the Detroit Pistons from 1986 to 1993, the San Antonio Spurs from 1993 to 1995, the Chicago Bulls from 1995 to 1998, the Los Angeles Lakers in 1999, the Dallas Mavericks in 2000, the Long Beach Jam from 2003 to 2004, the Orange County Crush from 2004 to 2005, the Tijuana Dragons in 2005, the Torpan Pojat in 2005, the Tijuana Dragons from 2005 to 2006 and the Brighton Bears in 2006. 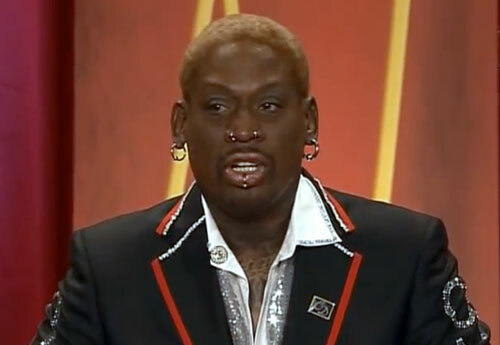 Rodman is a five-time NBA champion for 1989, 1990 and 1996 through 1998. He is a two-time NBA Defensive Player of the Year for 1990 and 1991 plus seven-time NBA rebounding champion for 1992 through 1998. In 2011 Dennis Rodman was inducted into the Basketball Hall of Fame plus his number 10 jersey was retired by the Detroit Pistons. Sports Speakers 360 is a booking agent for pro athletes. If you would like to book Dennis Rodman for a speaking engagement, appearance or endorsement, contact a Dennis Rodman booking agent for fees at 1.855.303.5450.